Book critic. That’s the hat I’m wearing for this entry today! Okay, well you can drop the extraordinaire bit. Probably a little much since this is my first critique. I just liked the sound of it, and I thought it made for a more intriguing title. Okay, so what am I critiquing you ask? Well, recently when I was doing my daily perusal of an adoption site, I found a post which was in search of bloggers willing to review a book for their readers. I’m an avid reader (especially now with all this pre-adoptive reading), and I’d never done this, but thought, what the hell?! It’ll be fun, and hopefully what I have to say will be a useful source of info for some of the people reading my blog. Plus, I get the bonus of access to what sounded like a very hands on and practical book. So I emailed the author, and here I am. Being my husband and I are just entering this process, I am voraciously reading anything and everything (books, websites, chat boards, blogs…), I can on adoption. I’ve read a good variety of books so far, but the common theme with the latest onslaught has been attachment, and helping to heal your adopted child. Carol’s book covers these issues and a whole lot more. The first thing that set this book apart for me was the format. To use Carol’s words, “This book’s format is in a magazine style for overwhelmed and busy parents.” Well I don’t fall into the “overwhelmed and busy parent” category just yet, so I read this book cover to cover. But the magazine formatting allows those whose reading time availability may fluctuate from a little to a lot. I already found the format helpful in being able to quickly locate and re-read particular areas of interest. I was able to put my highlighter and pen away for this book. The next thing that stood out for me was the way the book is written. Many of the books I’ve read thus far have been very textbook an clinical in their approach. Often those who share knowledge that is common to them, forget that it’s not common to their audience. Carol, despite being a clinical social worker, has broken the information down into practical advice, parenting techniques and exercises that are easy to understand and incorporate. In other books, I have found myself continuously having to return to previous explanations of exercises when they were revisited. The context of some exercises was not easily relatable to their purpose, and therefore hadn’t stuck in my brain. That is not the case with this book. The exercises are simple and practical. I could actually envision myself going through them as a future parent, and having my child be receptive to them. They made sense, and I could see how they could easily become ongoing and usable tools. The other thing I liked, was the story telling aspect of the book. It is used heavily, and I think that’s extremely beneficial. When trying to retain information, I think it is always much easier if you can have a story related to the information imparted. It’s one thing to read a textbook definition, but completely a different learning experience when you hear that information shared via stories and people you can personally relate to, or at least understand and empathize with. I know during my search for information, the static information I was finding on adoption wasn’t enough. I went in search of chat boards and blogs to get first hand accounts of life experiences. Real life stories are peppered throughout this book, and I think they definitely add merit to Carol’s teachings. Last but not least, was the three part, building structure of the book. I thought this was really well laid out. It takes you from start to finish, building on your parenting skills as you learn and grow. There are three distinct sections: your child’s history (understanding behaviours), resolution (helping your child heal), and education (becoming an advocate for your child). Again, this progression of learning, just made sense, and puts each part of the structure in perspective. “Is This Normal or Is It Foster or Adoption Related?” Being a first time parent, I’m sure I will encounter scenarios where I’m asking if this is normal behaviour for a child. But being a first time parent of an adopted child, throws another curveball. I’ve seen this question posted on so many chat boards, but had yet to see it covered in any previous adoption books I’ve read. Temper tantrums are prime examples of where this question comes into play. Carol explains how to differentiate between developmental and trauma related behavior. I enjoyed the segment on helping your child write a letter to their birthmom. I had seen this in other books, but it stopped after explaining the purpose and giving a standard template. They tend to follow the format of the child writes the letter, and parent and child discuss. Carol’s explains the purpose, gives the parent multiple approaches, and gives a very good suggestion for getting the parent directly involved from start to finish, which I thought was wonderful. She focuses on this healing the child’s lost connection to their birthmom, but I think it also would help with letting the child know that you accept their birthmother, and accept that they miss her, which is so vitally important. The letter to family and friends explaining what is supportive vs. hurtful to the adoptive family. Segment on recreating your child’s trauma, to help them re-visit and heal their painful past. The list of questions to ask when “interviewing” your child’s therapist. Overall, I would highly recommend this book to those entering, or already in the world of adoption. So many of the books I’ve read tend to use shock value to get their point across about the challenges of adoptive parenting. Carol’s book is honest and doesn’t sugar coat anything, but she reveals the difficulties from a place of compassion. She teaches pre-adoptive and adoptive parents to approach their child’s pain from that place in order to start the healing process. She enables them to be very hands on and not shut the door to therapy when you leave the therapist’s office. I know I will definitely buy a copy of this book that I can go back and reference as I parent my child. It will no doubt be a bumpy road, but learning Carol’s approach of empathy and humanity makes me feel more well equipped to handle the challenges that will inevitably come our way. 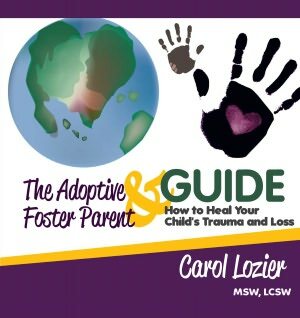 Carol Lozier, MSW, LSCW, is a clinical social worker in a private practice is Louiseville, Kentucky. She has spent over 20 years counseling children and families, specializing in adoption and foster care issues. She is passionate about helping children heal from past trauma and loss. She has written several articles and authors a blog, which offers practical strategies, guidance, and support for families. She is a contributing author to the book, The Foster Parenting Toolbox (EMK Press 2002).